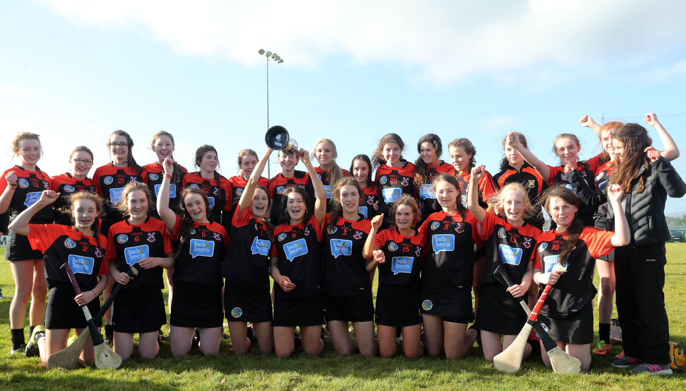 Congratulations to our Junior Camogs who have won the Corn Eimhear title for the third year in a row. They defeated St. Catherine’s, Armagh in the final on a scoreline of 9-14 to 4-7. The game was played in Ballinderry on Sunday 29th October and was a high scoring affair with both teams displaying a high level of skill and commitment. Riana McBride was the star player on show, scoring 3-7 and she was ably assisted by Katie Laverty in midfield and Ciara Laverty who dominated in defence. CPC started brightly and raced into an early lead after 10 minutes of 1-4 to 0-1, but the Armagh girls finished the half strongly and cut the gap to just a goal. However, the CPC girls upped the ante at the start of the second half and goals from Alicia Butler, Clodagh O’Kane, Aine Magill and Caoimhe Donnelly sealed the victory.